On Dec. 2, Soprano Anna-Sophie Neher capped a very busy and successful fall by winning the 2017 Wirth Vocal Prize at Pollack Hall. 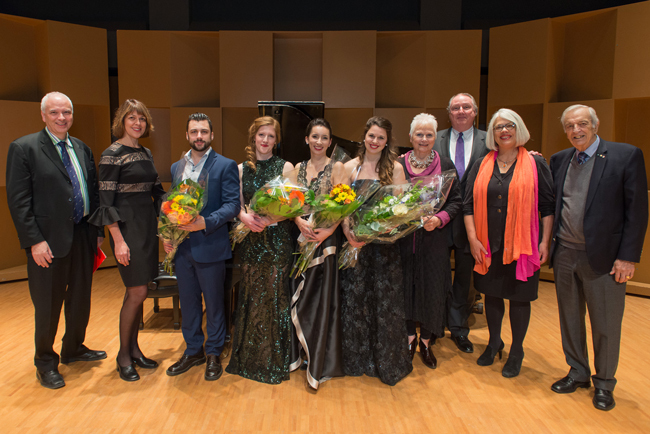 On top of the Wirth win, Neher has recently won the Prix Étoiles Stingray from l’Opéra de Montréal, third prize at the Canadian Opera Centre Stage Competition and first prize in the voice category at the OSM Manulife Competition. Anna-Sophie Neher during the finals of the Wirth Vocal Prize held at Pollack Hall last weekend. On Dec. 2, McGill’s Anna-Sophie Neher capped a very busy and successful fall by winning the 2017 Wirth Vocal Prize at Pollack Hall. 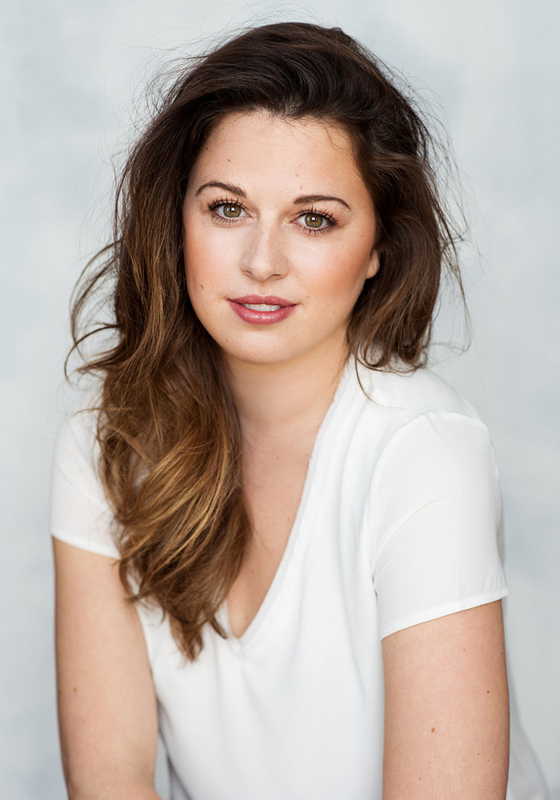 On top of the Wirth win, the soprano has recently won the Prix Étoiles Stingray from l’Opéra de Montréal, third prize at the Canadian Opera Centre Stage Competition and first prize in the voice category at the OSM Manulife Competition. Not bad for a singer who has spent a large part of her music career as a pianist. There is a definite soundtrack to Neher’s childhood, one that, not surprisingly, is rooted in both song and piano. “Our Christmases were full of music and songs – but never classical music,” she says. “It was always folk songs and music from Quebec. So much so that, while she admits there were moments when she would have preferred playing outside with her friends, most of the time she was happiest at the piano. “My time at McGill has been great,” says Anna-Sophie Neher. “Everybody’s always looking out for each other and is really supportive. It’s been really wonderful. Despite her talent at piano, however, Neher admits she felt like something wasn’t quite right. “I loved piano but it never felt like it was meant to be for me when I was on stage,” she says. “On stage I always felt like there was something missing, that I was too nervous and I could never perform like I wanted. Neher had been singing in the Gatineau Music Conservatory for many years, but it wasn’t until a music theory teacher asked the 17-year-old to sing some notes that things really started to take shape. “He said ‘you have such a beautiful voice, you should take voice lessons,’ and that’s when I kind of realized that I could be a singer,” she says. At 19, Neher decided to take the plunge and become a classical singer. 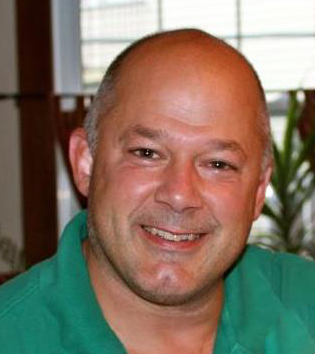 “I wasn’t too nervous about making the transition. It was time I didn’t want to spend another year practicing piano five hours a day,” she says with a laugh. Instead, Neher follows a very different routine, singing in multiple 30-minute intervals with breaks in between to preserve her voice. “For me, I find being a singer is harder [than being a pianist] because there’s more sacrifice,” she says. “Your instrument is not something exterior. It’s your body and it’s your voice so everything you do is in support of it. It means you can’t go out partying and staying up late at night because the next day you need your voice to be at its best. 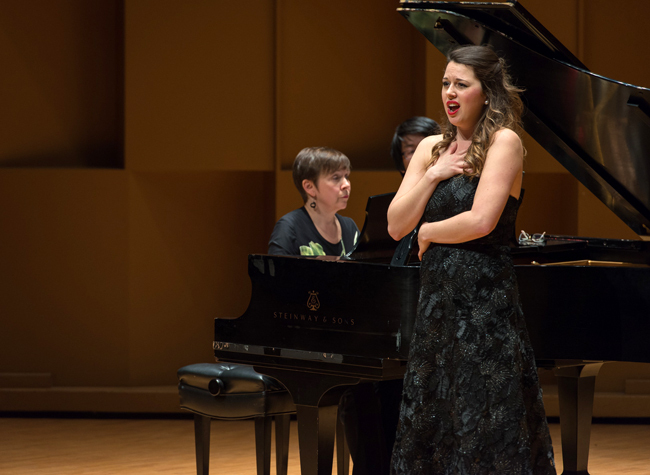 Those emotions were running high at the finals of the Wirth Vocal Prize last Saturday. “It was such a lovely event. You get to perform for all your friends because most of the Voice Department is there supporting you. They know how stressful it is. So you’re performing for your friends,” says Neher. Then there is the live feed which is cool because friends and family can listen to you from around the world. “You have so much love coming from all over the place and people just want you to sing well. It was just a great experience.” Channeling those emotions, Neher performed works by Mozart, Morlock, Poulenc, Wolf and Rossini to secure the title, which comes with $25,000 in prize money, performance opportunities in Montreal and Toronto and career coaching sessions with Marie-Catherine Lapointe of Boulevart Artists’ Management in Montreal. Neher is finishing her Masters here and will graduate in this spring. While she says she has plans in the works, she is not at liberty to say what they are just yet. “I will definitely be singing next year,” she says with a smile. From left to right: Stéphane Lemelin, Brenda Ravenscroft, Jean-Philippe Mc Clish, Gina Hanzlik, Carolyn Beaudoin, Anna-Sophie Neher, Elizabeth Wirth, Stefano Algieri, Kathleen Kelly, Joseph Rouleau. / Photo: Peter Matulina.